I’m more than thankful for my invite to DARKOH’s Spring 2015 Menswear show. I honestly didn’t know what to expect. I did no research I liked to be surprised when I encounter new designers, and surprised I was! Started by Joyce Darkoh this line is just one season old debuting in February 2014. All hail a woman who can do a man’s job and does it well, not that making men’s suits is a man’s job, but you catch my drift. Joyce partnered up with tailors from Saville Row to ensure her suits fit the male form perfectly. From the moment the lights came on till the first model stepped out I was already hooked. Suits! Who knew I was attending a show catered to menswear and men’s suits at that, and not just the normal suit not the blue and grey stuff, but suits with a personality! Colors! 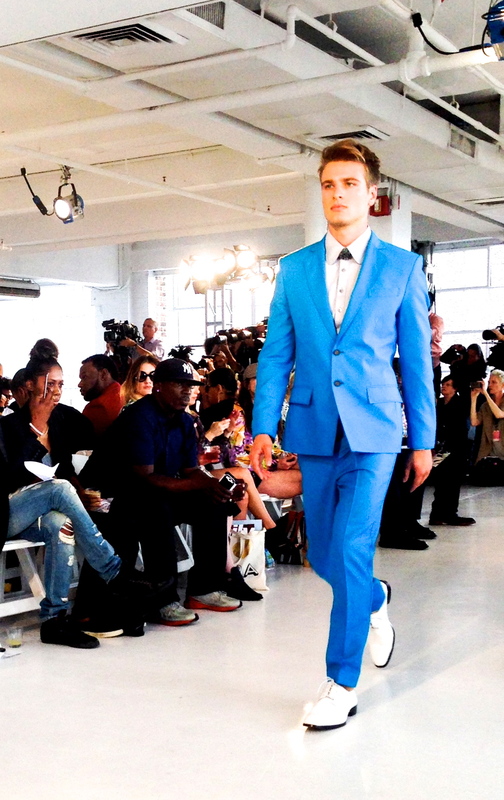 When the first model hit the runway I immediately prepared my camera for this electric blue suit I don’t do color too often, but when I do I want to do it well, and this suit is definitely an eye catcher. 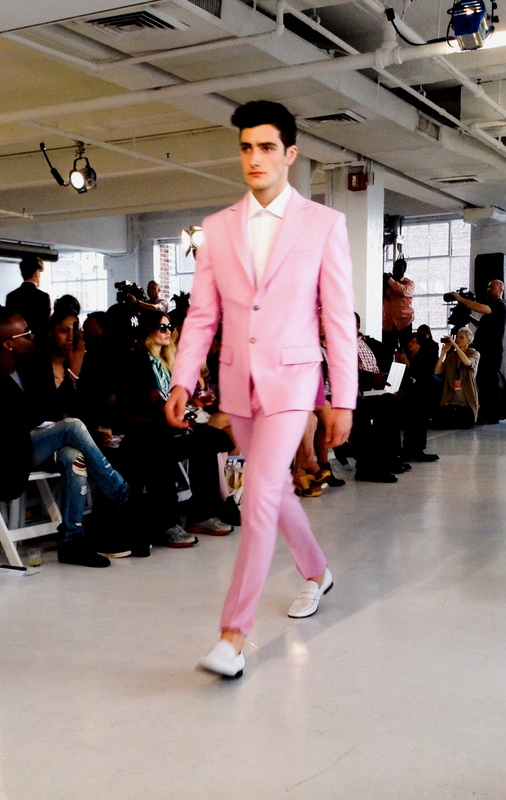 Shortly thereafter this pink concoction made its way down the runway and all I could think of was how perfect these suits are and can be for a person like me. People constantly complain about how boring menswear is, but I get joy from it. I’m not sure what everyone else is reaching for, name one thing you’d like to see designers do in menswear. Right now! Name it! Perhaps it’s the way these men put together their looks or for better words don’t know how to put together their looks. It’s just so baffling you people have had hours upon hours! Back to Joyce! It’s a rarity to see a women take on a whole menswear line, but I appreciate it so much. There’s always a man making women’s clothing, but the opposite doesn’t happen often. These two personified suits weren’t the only stars of this condensed line. Joyce had more than a handful of immaculate suits that breezed by the audience. Now although she focused more on the suit side of menswear; Joyce did present us with a few casual looks which looked equally as good. Very relaxed, and tailored looks as well; the sweater she presented was astonishing and paired well with the pants she or the stylist picked out. Take a look below at the rest of the collection, and dissect away my friends. I really like the looks on the bottom I’m not really into the whole pastel color thing so the neutral looks are perfect especially the more relaxed looks with just the pull over, and pants.